Colgate brush heads compared and reviewed: which is best? Just like Oral-B and Sonicare, Colgate like to offer you options when it comes to your electric toothbrush and the brush heads available for it. As we write there are now 5 different electric toothbrush models and 4 different styles of brush heads. Which brush head is compatible with which model and what are the differences? What one do you need or want? We do hope that this page, complete with detailed explanations and brush head comparisons, will answer many of your questions and help you find the right brush head for you and your Colgate brush. What’s the best Colgate brush head? Which brush heads are compatible with my Colgate toothbrush? There is a reason that 4 different brush heads exist, they are all designed to do something slightly different, if they didn’t what would be the point?! As a result, deciding which is ‘the best’ is not really that simple. As we’ve said above it’s hard to say exactly which brush head is ‘the best’, but to make a bit of a sweeping generalisation, we would suggest that the ‘360 Deep Clean’ brush head (view on Amazon) is the best solution for most users to opt for. For a long while, the Triple Clean head has been the go to model but a recent refresh within the brush heads available makes the Deep Clean for us the ideal all rounder. There may well be one better suited to you, which you can decide upon based on the information provided below. Whilst many of us enjoy pain free brushing, if you are one of those who find the whole experience to be uncomfortable due to the sensitivity you have in your teeth and gums, you need something that as best as possible eases that pain, but still cleans effectively. 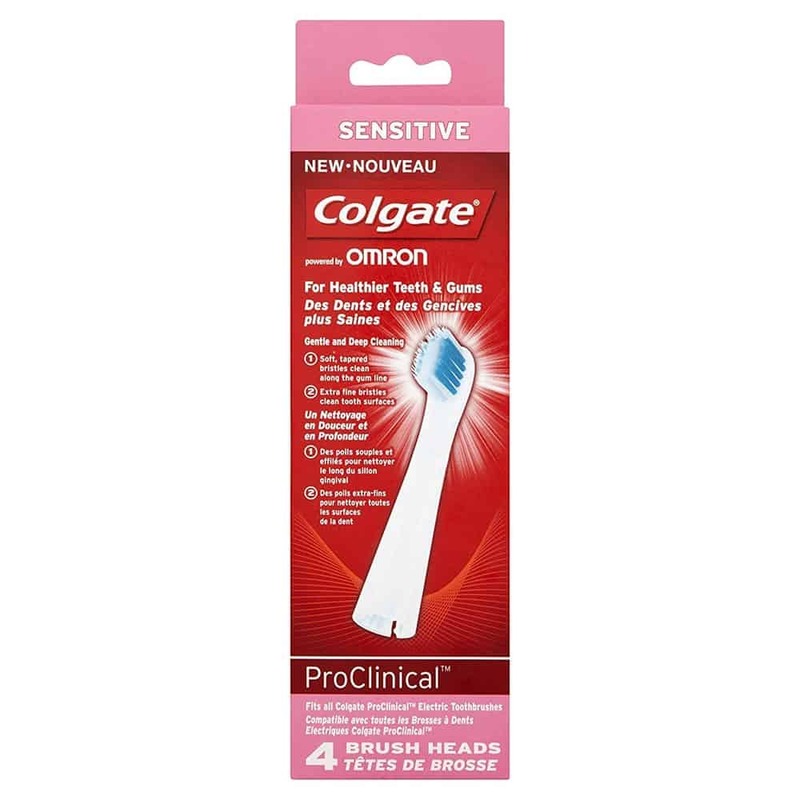 If you suffer with sensitivity you may want to use the Colgate Sensitive brush head (view on Amazon). The soft bristles clean the teeth effectively but do so with a not so aggressive approach allowing you to benefit from the enhanced clean an electric toothbrush brings but hopefully without the same discomfort. Having white teeth can often give us an extra confidence that allows us to smile and feel better within ourselves. Often when we look good, we feel good. Whist you might have to undergo professional whitening to get that ‘Hollywood smile’, it is perfectly possible to improve the shade of your teeth from the comfort of your home and at a much lesser price. Using the Colgate 360 Whitening brush head (view on Amazon) alongside a decent quality whitening toothpaste such as AP24 from NuSkin can improve your tooth colour by 2-3 shades. Those with heavily stained teeth will see the greatest improvements. Depending on your model of brush there may too be a more suitable cleaning mode, such as Optimum which delivers more power to help buff those teeth to give them that gleam you desire. You likely don’t need us to reiterate the importance of brushing your teeth, especially when you have braces. Nobody really wants to be left with staining on their teeth when the are removed. By their very nature fixed braces give greater surface area for food and debris to stick to and more places for bacteria and plaque to build. It is easy to think that you need specialist brushes and they do exist. However with a Colgate electric toothbrush you can use any of the brush heads safely with braces, you do not need a special brush head. Competing brand Oral-B do recommend an Ortho brush head, but this is not essential. However to ensure you cleaning as effectively as possible, specialist interdental brushes such as those by Teepee are advised as part of a good cleaning regime. Only you can really decide which is the best brush head to use. Our recommendation for all round cleaning is the 360 Deep Clean brush head (view on Amazon). However, if you are on a mission for whiter teeth there is definately benefit in opting for the whitening head, whilst the sensitive brush head will be more suited for those who suffer pain, bleeding or experience discomfort when brushing. All brush heads will help to remove more plaque than a manual toothbrush whilst improving gum health and your overall oral hygiene so it is not like any will clean terribly, some are just engineered differently to achieve a slightly different result. Cleaning your teeth properly twice a day for 2 minutes each time is the most important part here. 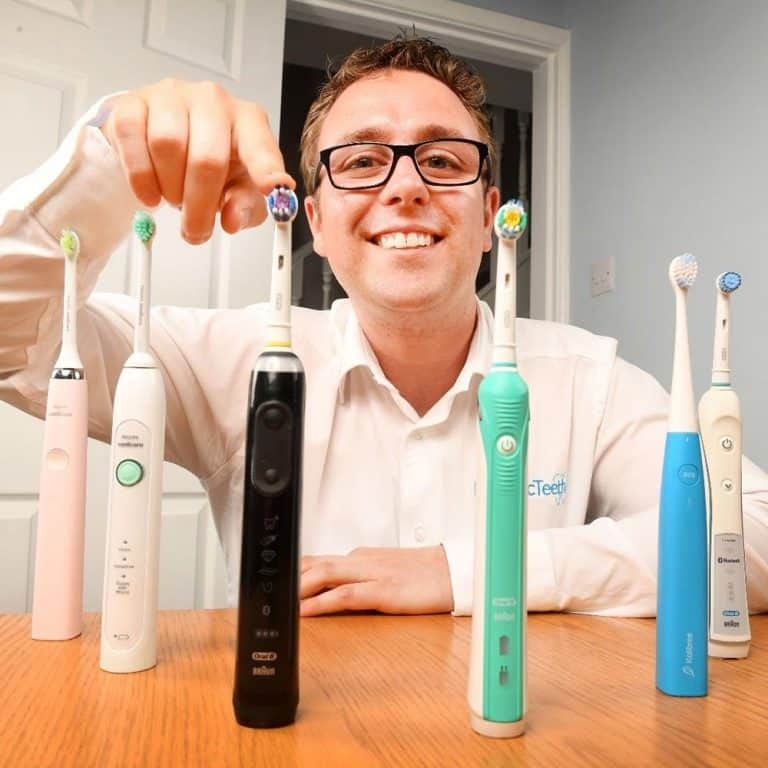 Our full article on how to brush your teeth with an electric toothbrush explains the correct way to brush your teeth as a poor teeth cleaning approach is more damaging than the incorrect brush head. The reality is each brush head can just give that extra bit of focus in achieving and assisting oral health care goals. The full range of Colgate brush heads and pack sizes are as follows. We have included the Amazon links for them in this list, but we’ve also included links to other retailers just below. We will now go on to explain the Colgate ProClinical brush heads in detail and make it easier for you to understand which brush head to opt for. Whilst we will explain in more detail further down this page on what the 4 different brush head styles are, we want to make it clear how much simpler Colgate’s range is compared to the likes of Sonicare. 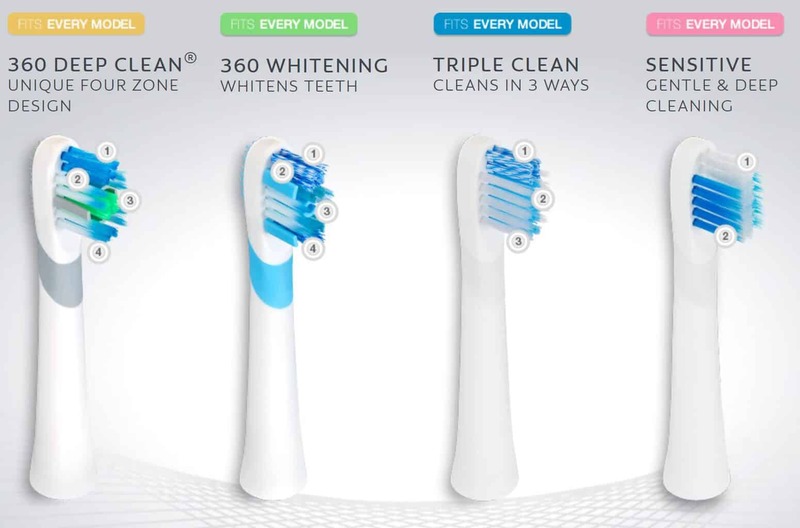 Sonicare have 6 ranges, each of which may be available in a standard or compact size. If you have previously had a Sonicare brush and have or are thinking to moving to Colgate then the process of choosing is a lot easier. 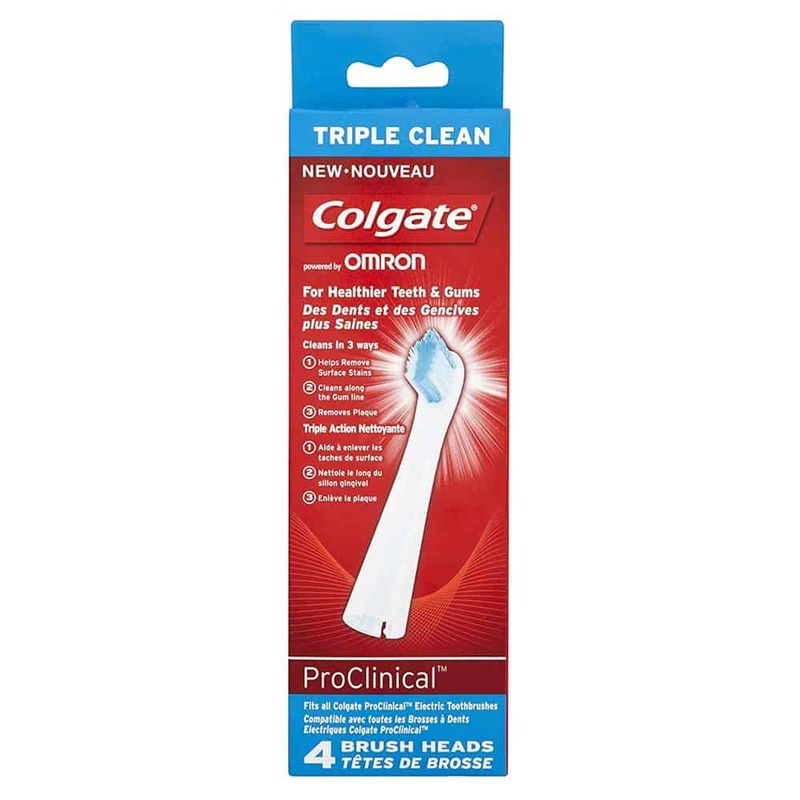 Whether you expected it or not, the good news is that all 4 brush heads fit all of the Colgate ProClinical line of brush heads, they are fully interchangeable. Therefore no matter whether you have the cheapest, or the most expensive model you can change brush heads as often as you like with ease, just pull them on and off. Assuming you will be able to decide which brush head is for you, you will then need to consider what pack size to buy. Typically the 4 different brush heads come in packs of 2 or 4. In many instances what you can buy is determined by the retailer and the availability. Not all stock all the range in both pack sizes for example. Typically purchasing the larger pack works out more cost effective. What does each brush head do? Now for a little more detail on each of the the different brush head types and what they are used for. The deep clean brush head is designed to target 4 key areas when brushing. At the top of the head are soft tipped bristles to sweep and clean along the gumline. Powertip bristles to clean deep in between teeth and hard to reach areas. A soft rubber cup polishes teeth, to buff them and help make them whiter. On the back of the brush head is a rubber tongue and cheek cleaner. The textured surface helps remove odour causing bacteria from the surface. This brush head clips on and off your brush handle for a secure fit and easy maintenance and cleaning. It fits all Colgate ProClinical electric toothbrush handles. This head also has reminder or indicator bristles which fade over time as you use the brush head. These reminder bristles begin begin being Blue in colour but fade to white. This helps you monitor when it is time to replace the head. For optimal results, replace your brush head every three months. 360 Deep Clean brush head work with all Colgate ProClinical electric toothbrush handles. The 360 Whitening head is one of the newer options available from Colgate specifically focused on achieving whiter teeth. There are 4 key features to this brush head and the bristles that form a part of it. At the top there are Blue and White spiral bristles that help remove surface stains. A soft rubber cup in the centre of the brush polishes teeth to achieve that dentist like clean finish to the teeth. Thin tipped and soft bristles sweep along the gumline to remove as much plaque and bacteria as possible to leave a clean and fresh feeling in the mouth. 360 Whitening brush heads work with all Colgate ProClinical electric toothbrush handles. Each re-fill brush within the pack has a different coloured strip for easy identification, ideal if used in a family environment, a different colour for each user. 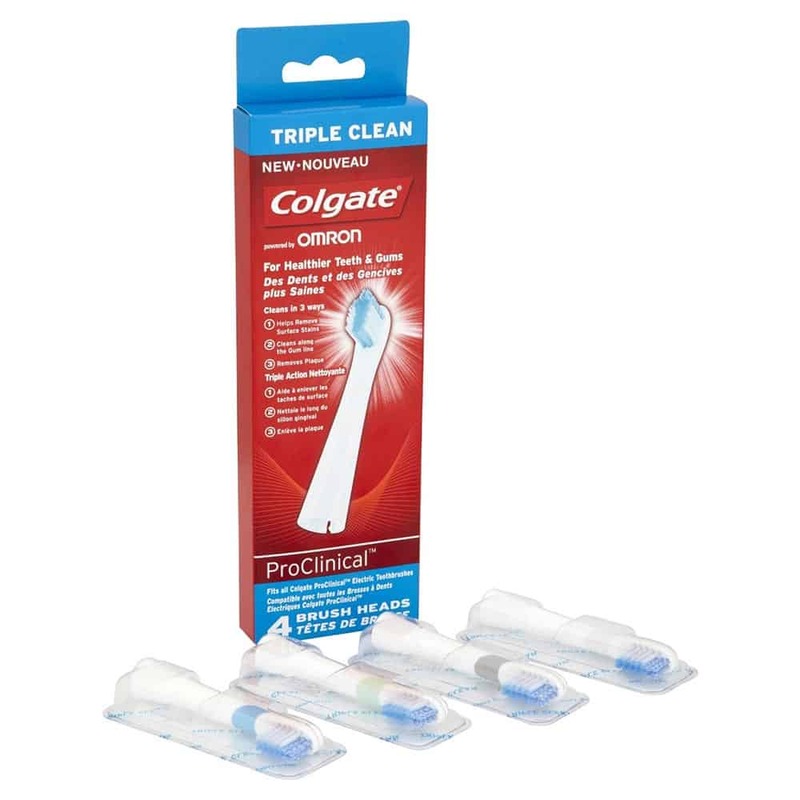 Triple Clean brush heads work with all Colgate ProClinical electric toothbrush handles. The Sensitive brush head is focused achieving deep cleaning, but in a way that is more sensitive than most other brush heads. If you suffer from sensitive teeth and gums this could be the brush head of choice. 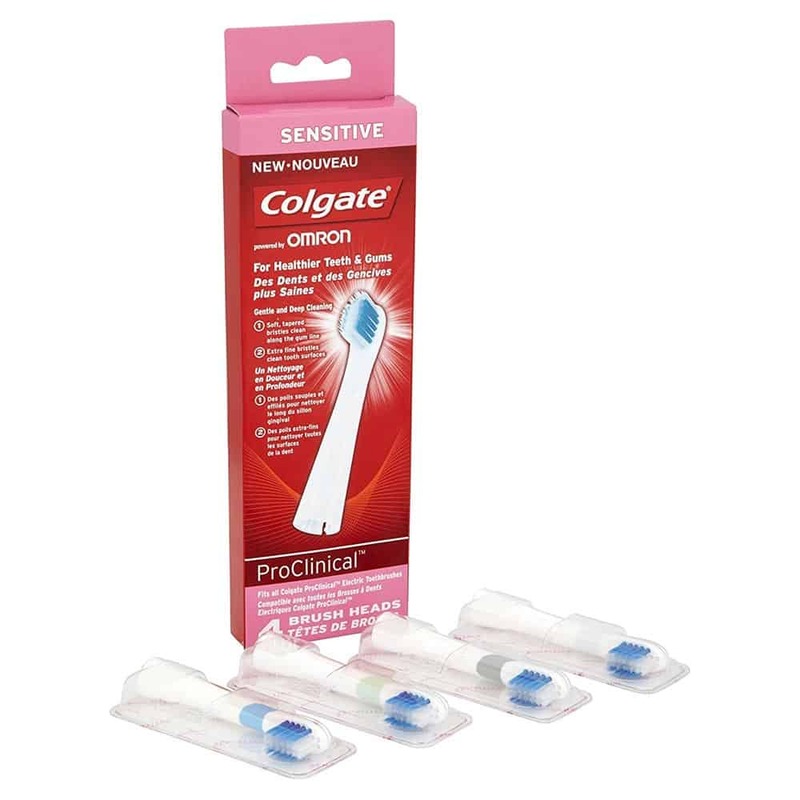 The Sensitive brush head work with all Colgate ProClinical electric toothbrush handles. Your dentist or hygienist may tell you to brush twice a day for 2 minutes. They may also tell you to replace your toothbrush every 3 months too. They are not saying this for a bit of fun, it is because this advice is based on years of testing and experience. After 3 month’s of brushing twice a day, your head has gone through quite a lot. And more often than not the head is worn out. Modern production standards mean that for many the brush head still looks in very good shape, but it is advisable to replace it still. Just a few stray bristles can be doing more damage than you think. You don’t want to be undoing the benefits of regular brushing with an electric toothbrush. weeks of use will gradually start to part. It is at this stage that the brush heads lose their effectiveness. Particular bristles on the head will start out Blue and will over a 3 month period fade to White. Your teeth and gums are important and using a brush head with bristles in poor condition is almost as damaging as not cleaning your teeth at all. It is important that the bristles on your Colgate brush remain in good condition. If they are splitting, fraying or becoming misshapen, look at replacing. Are the Blue indicator bristles now white? All of these things are signs to potentially change your brush head. A brush head should be replaced on average every 3 months. For some, this will be sooner, if your bristles are wearing faster. How do you replace the heads on the Colgate brushes? In two simple stages. Holding the brush in front of you, twist the brush head approximately 90 degrees to the left, to unlock the head and then pull the brush head away from the brush handle with a small amount of force to release the connection. You will reveal a plastic prong that is the shaft that connects to the motor. The head is now detached. Fit a brush head by pushing the plastic shaft from the top of the brush handled into the hole in the bottom of the brush head. Your brush head will need to be oriented approximately 90 degrees to the left. Push the two firmly together and twist to the right. You will feel it lock into place. Quite simply, all of the brush heads shown on this page work with all of the Colgate ProClinical brush handles. Nice and simple, it is a fit all approach. I bought a Colgate Omron battery powered toothbrush on special offer. I’m now trying to find more toothbrush heads for it but all I can find are heads for Omron ProClinical! There is nothing more on my toothbrush – just Colgate Omron – with no model number. It has batteries in the handle. Can I use heads designed for the ProClinical? 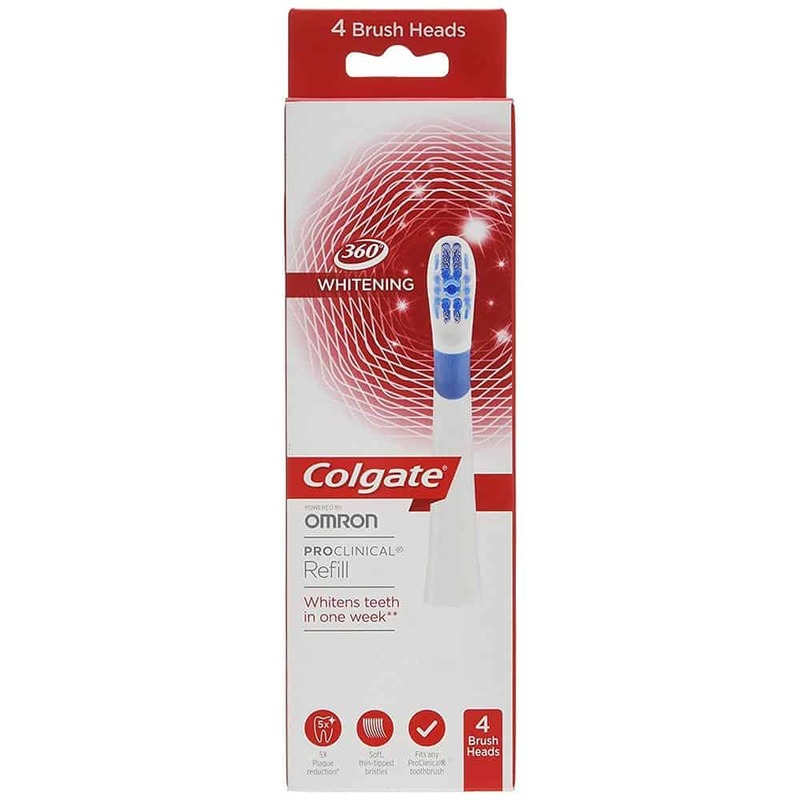 Does your Colgate Omron brush look like the one shown in the images within this review? If so, you can use any of the heads listed in this article. I believe the answer you are looking for is yes. Most recent toothbrushes from Colgate, are to my knowledge made in partnership with Omron, hence Colgate Omron. Often the brushes are then given a name, where Omron is not included, i.e Colgate ProClinical 250. If you have a much older brush it may be worth double checking, but I am pretty confident you will find any of the mentioned heads will fit just fine. Hi Jon, I bought my daughter the black Omron 250 last year for Christmas and I’d like to get her some replacement heads. Are the 360 ones compatible do you know? Many thanks Janny. Yes, they are compatible. The good news is all the current Colgate brush heads fit onto any of their current range of electric toothbrushes (the exception being the Colgate Connect E1 toothbrush). Thank you for getting back to my Jon, your very kind. You can use any of these heads Terri with the ProClinical Pocket Pro.